Police vehicles outside an LCBO outlet in North York, Toronto, February 3, 2019. Photo by @MackenzieTammi/Twitter. Used with permission. You may soon see additional security the next time you stop at your local LCBO for beer or spirits. The Liquor Control Board of Ontario has announced it is expanding its shop Theft Action Plan in an effort to protect consumer safety and prevent theft. 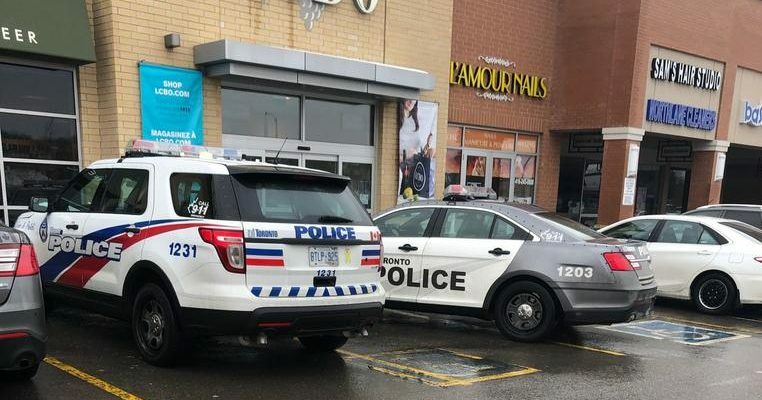 In an email to Blackburn News, a spokesperson for the LCBO said the plan will expand on three existing priorities: increasing security personnel at select LCBO locations, implementation of new and industry-leading technology to combat theft, and ongoing mandatory training for all LCBO employees in order to take safe action and be credible witnesses when theft does take place. In addition to more security guards at select locations, the LCBO will continue to identify ways to curb theft and improve the safety of customers and employees at all of its outlets. The LCBO said since April 2018, LCBO contract security and local police have arrested over 850 liquor theft suspects in Toronto alone. Over a thousand charges have been filed. It was not disclosed which outlets may see additional security.